For many years now, brands and retailers have understood that mobile puts great power in the hands of customers, enabling them to access services on-the-go and take greater control over the retail experience in ways that simply weren’t possible a decade or so ago. However, it has to be said that, generally speaking, less fuss and less focus has been placed on what mobile can do for employees, and how a mobile-empowered workforce can enhance the customer experience at all points of the buyer’s journey. There are some brands, however, that are fully embracing the idea of equipping employees with a suite of advanced applications accessible via on-hand mobile devices, and United Airlines is one of the latest to come flying out ahead on this front. In a new collaboration between the airline, IBM and Apple – announced earlier this year – United is bringing a robust suite of enterprise iOS apps to its gate agents and flight attendants in order to enhance the flying experience of its customers. The move promises to create greater levels of functionality on the 50,000 Apple iPads and iPhones that United has issued to its front-line employees. The goal is to give the airline’s workforce ready-to-hand access to customer information on their Apple devices, as opposed to relying on non-mobile solutions – such as desktops tethered to terminals and checkpoints – as it has done in the past. Putting the customer experience at the very forefront of the initiative, United is asking the people who know its customers best – United employees – for their opinions on which features should be included in the apps that are being built for them. In February, gate agents and flight attendants met with IBM and Apple in Cupertino to discuss the development. "A partnership with Apple and IBM gives our app-development enterprise scale, reusability, and – most importantly – speed," United Airlines Chief Information Officer Linda Jojo told Business Insider in an interview. "We're going to be able to deliver more tools and technologies faster to our front line than we could if we were building it all ourselves. “Last week, we had flight attendants and gate agents in Cupertino with our technical team, with IBM, and with Apple," Jojo continued, adding that they were working on software she said would "allow flight attendants to communicate maintenance items discovered on the plane back to the maintenance teams." Powered by analytics, the solution is being further customized as part of United’s digital transformation drive, and of course to facilitate employees with the capabilities needed to better meet customer needs in real-time. Flight attendants will be able to use their iOS devices to gain greater visibility into which customers are connecting, and thereby assist them in finding their gates when they arrive at the airport. What’s more, customer service agents need no longer be tied to their work stations, as mobile gives them the freedom to move about and assist customers where they are and help to ease congestion during busy periods and/or emergencies. Employees will also be able to use the apps to quickly look up customer information and scan tickets in order to help them navigate the airport and direct them towards required services. "Our employees are now mobile — they're not stuck behind a desk anymore," Jojo said. "At the gate, we now have an agent that can close out a flight, or if there's some kind of problem, they can actually issue boarding passes and bag tags right from a printer that's on their hip, and it's all done from a mobile device." This latest innovation comes on the back of United’s long-running strategy to empower employees through mobile. 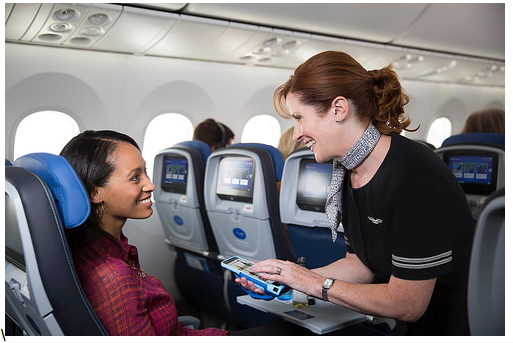 United flight crews first received iPads back in 2011, when they served as digital maps and other navigational tools. In 2014, United began issuing iPhones to flight attendants and gate agents. "We wanted to have the best devices in the hands of our employees," said Jojo. Now, with IBM set to develop a whole new suite of iOS apps for the airline’s growing deployment of mobile devices, United appears dedicated to improving the employee’s ability to help the customer, and not just improving the customer’s ability to help themselves – something that’s becoming increasingly crucial in all busy retail environments of any nature. Hear Jeff Ulrich, Sr. Manager, Digital Innovation & Mobile App at United Airlines at Mobile Shopping 2017 this October.